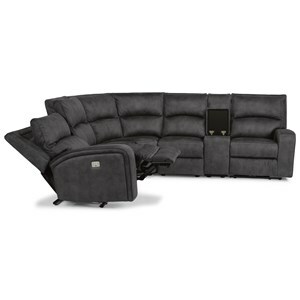 Offering casual style, functionality and a reliable, time-tested spring support system all in one piece, this manual reclining sectional is a great investment that you won't regret. The luxury seat cushions, lumbar supporting divided back rests, plush pillow arms and fully-padded footrests will provide full-body comfort while you relax in your home. An included straight console with two cupholders offers a safe spot for beverages. This sectional is made in America and available in a wide selection of fabrics and leathers, allowing you to choose a piece that will blend seamlessly with your existing furniture. The Rio Casual 6 Piece Manual Reclining Sectional with Cupholders by Flexsteel at Fashion Furniture in the Fresno, Madera area. Product availability may vary. Contact us for the most current availability on this product. 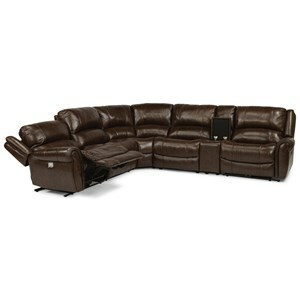 2904-59 Armless Recliner 1 26" 39" 42"
2904-19 Armless Chair 1 26" 39" 42"
2904-23 Full Wedge 1 53" 53" 42"
2904-58 RAF Recliner 1 31" 39" 42"
2904-72 Straight Console 1 10" 38" 42"
2904-57 LAF Recliner 1 31" 39" 42"
Padding & Ergonomics The High Resiliency Cushion comes standard and uses a 2.0 lb. 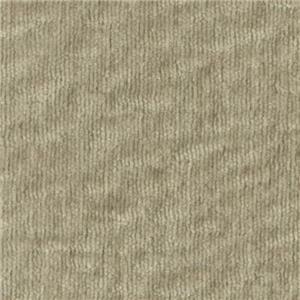 high-resiliency, high-density polyurethane foam core topped with 1.2 lb.  density polyurethane recovery foam and bonded polyester fibers. 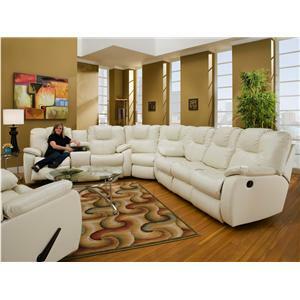 Create a living room space that's perfect for your lifestyle with this reclining collection. This collection offers a variety of models with different features from power to non-power, swivel to rocker bases and stationary to adjustable headrests. Every model is equipped with Flexsteel's DualFlex Spring System that has been proven to provide support over the lifetime of the piece. Power models include a USB port for charging your devices while you relax in comfort. Each piece is available in any of Flexsteel's South Haven fabric and leather line with additional USB ports and other upgrades available. 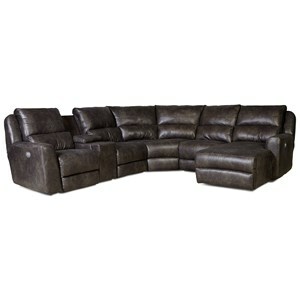 The Rio collection is a great option if you are looking for Casual furniture in the Fresno, Madera area. 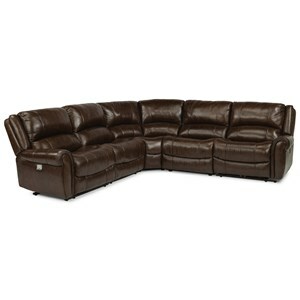 Browse other items in the Rio collection from Fashion Furniture in the Fresno, Madera area.